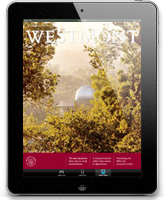 In 1945, Westmont faced the biggest crisis in its short history. After buying an Altadena golf course and clubhouse, the college sold its cramped Los Angeles campus and prepared to move. But county officials denied the zoning change required to operate at the new site with a 3-2 vote. The community was stunned. They’d been sure God had provided a new home. Where could they go? First, the golf course sold for $438,000, more than twice its cost. Then the frantic search for a new campus ended quickly. In August 1945, Mrs. Kerr drove to Santa Barbara to see the Arcady Estate on Sycamore Canyon Road. With 143 acres, a large home, an extensive lemon grove, a pipe organ and two swimming pools, it seemed ideal. But the owners wanted $300,000. Then she visited nearby Rancho El Tejado, the Holland estate. As she drove through the gates, Mrs. Kerr said the Lord whispered, “This is the place I have chosen for you.” The Hollands asked only $125,000 for their Mediterranean-style mansion and 125 acres. The trustees voted to purchase it. The college leased a grammar school on Alameda Padre Serra (now part of Brooks Institute) for a women’s dorm. Ruth McCreery, dean of women, recalls putting 40 beds in each room. “I wondered what the students and parents would think, but I never heard one word of complaint,” she said. The college soon purchased better housing: Emerson Hall, a 40-acre estate on Ashley Road. Neighbors provided living space for the men. “Mr. and Mrs. Klinger came to us voluntarily and offered us their estate at a figure that required only a small down payment with liberal terms on the balance,” Mrs. Kerr recalled. “They stated they had observed our students closely . . . and because of their high caliber felt they were a real asset to the community.” The Klingers’ home became Catherwood Hall until the Coyote Fire destroyed it in 1964. Santa Barbara turned out to be a much more desirable location than Altadena, and Rancho El Tejado created a charming setting for a college. 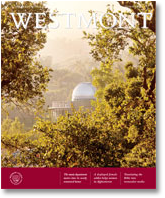 Westmont has lovingly preserved features of the estate: gardens, pine forest, lily ponds, fern dells and stone bridges. Today it’s easy to trace God’s hand in the Altadena crisis. But the people who lived through it survived on faith. They were convinced of things they couldn’t see, and they trusted in God’s faithfulness. The Westmont we know grew out of their prayers and hope.